Allstate Temporary Fencing is constructed with tubular steel and chain mesh. Our fencing panels are available in 3.3 metres wide x 2.2 metres high, or 2.4 metres wide x 2.2 metres high, with a top row of barbed wire where required . The fence panels are erected using concrete blocks, lightweight blocks or star pickets, depending on the site or customer requirements. We also utilise stays to the ground where necessary, to stablise the fence panels and hold the fence rigid. Our company can also provide vehicle access gates and personnel gates. Shade cloth can also be supplied for on site dust reduction and privacy and we can offer a shadecloth supply and installation service only for existing fences. Allstate Temporary Fencing also hires temporary pool fencing. 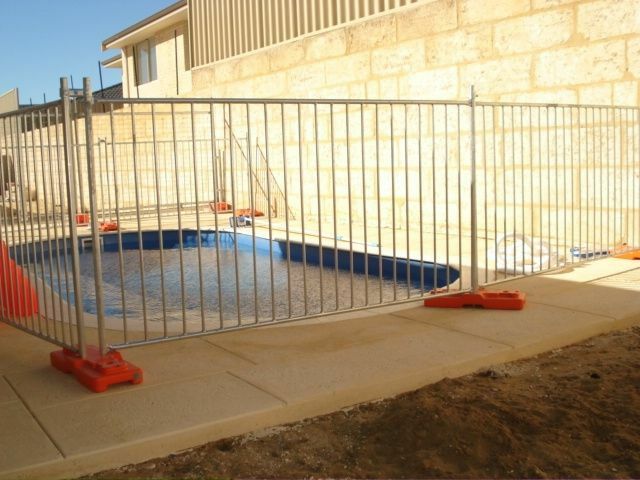 Our pool fencing complies with Australian Standard A.S 1926.1-2007 Swimming Pool Safety Barriers for Swimming Pools. Temporary Pool Fencing can be used during and after construction and self closing pool gates are also available if required. New laws regarding swimming pools and spas came into effect in Victoria othe 1st of May 2010. These new laws stipulate that new swimming pools and spas with a depth greater than 300mm (30cm) require a compliant safety barrier. Non-compliance with the regulations not only risks lives, but pool owners could also risk fines of up to $5000.